Mens orange and white cotton floral bow tie. High quality handmade tie by Because I'm Me. 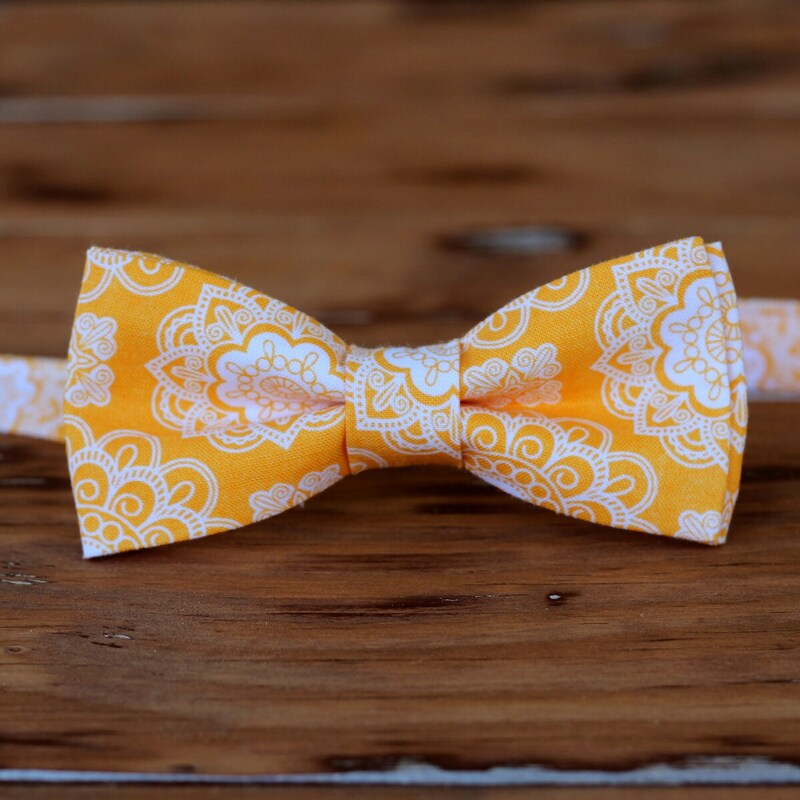 This orange and white medallion print bow tie is a wonderful complement for your wedding, dressy occasion, and photo shoot. The ties are pre-tied with a full neck strap, giving the polished appearance of a self-tied tie without the work. Each tie is made to order, so will be unique. The ties are 100% cotton and spot cleanable. Thanks for looking. Please contact me if you have any questions or need further information. Orders will be shipped within 3-5 days of purchase. This tie will be perfect for my sons 1st communion. Thank you! I accept Paypal payments, debit, and credit cards through Etsy checkout and Paypal. If in the rare event that you need to cancel your order please do so within 12 hours of placing order to receive a full refund. An invoice will be included with your purchase, in an effort to provide the post office with shipping information if your package is damaged. If your item is a gift and you do not want pricing information included please let me know ahead of time. If your item must be returned please contact me. Because I'm Me accepts returns within two weeks of item receipt and will refund the purchase price when the item is received by us. All packages are shipped through the United States Postal Service, both inside and outside of the United States. Items shipped within the US are mailed USPS First Class (3-5 business days for delivery) unless the buyer opts for USPS priority shipping (1-3 business days for delivery) at check-out. Buyer is responsible for all international customs charges. If you are an international customer we will get your order out as quickly as possible, however there are often delays in international orders and we suggest planning on your order reaching you in 3-4 weeks. All items are handmade within our shop and are shipped within 3-5 days of purchase. Any delays caused by the USPS aren't our responsibility and we appreciate your understanding. Please make sure your shipping address is correct when making your purchase. I accept no responsibility for lost, delayed, or returned items due to an incorrect address. You can easily track your order by going into your Etsy purchases. I mark all items as shipped the day they are mailed. Orders of four or more ties in the same fabric qualify for a 20% discount. Just ask!